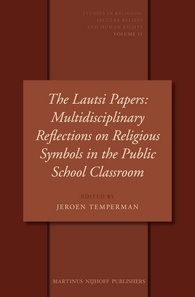 This November, Martinus Nijhoff Publishers will publish The Lautsi Papers: Multidisciplinary Reflections on Religious Symbols in the Public School Classroom edited by Jeroen Temperman (Erasmus University Rotterdam). The publisher’s description follows. Increasingly, debates about religious symbols in the public space are reformulated as human rights questions and put before national and international judges. Particularly in the area of education, legitimate interests are manifold and often collide. Children’s educational and religious rights, parental liberties vis-à-vis their children, religious traditions, state obligations in the area of public school education, the state neutrality principle, and the professional rights and duties of teachers are all principles that may warrant priority attention. Each from their own discipline and perspective––ranging from legal (human rights) scholars, (legal) philosophers, political scientists, comparative law scholars, and country-specific legal experts––these experts contribute to the question of whether in the present-day pluralist state there is room for state symbolism (e.g. crucifixes in classroom) or personal religious signs (e.g. cross necklaces or kirpans) or attire (e.g. kippahs or headscarves) in the public school classroom.